Specific details play a key role when conveying what a space will feel like in its final state. Part of our process for this home in Dover was to obtain a site plan showing the proposed design, so we could accurately portray sunlight conditions, angle and location. 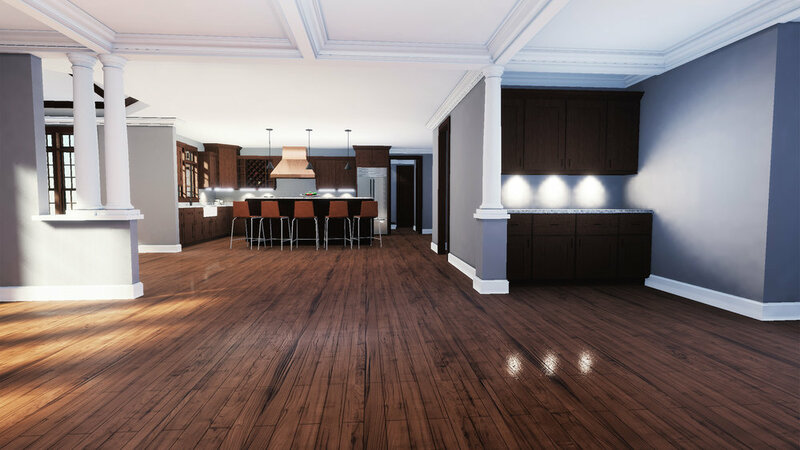 While the main emphasis was to build out these three adjacent areas, Family Room, Breakfast Area and Kitchen, we felt that accurate lighting conditions were important to further understand the openness of the design for client. The entire first floor was built out in 3D and once in the VR space, the client was able to freely walk around from space to space. As with other experiences, the client was completely intrigued by the fact that they were standing, and could walk around in, their future home. With the home construction coming to an end, the client is exceedingly pleased with the amount of openness and flow the space provides.